Add Country Western style to your bar or kitchen countertop with this fancy cowboy boot wine bottle holder. No self respectin' saloon should be without this finely detailed wine bottle holder, trimmed with rope, a spur, buckles, and a fitting Texas star badge, it looks realistic enough to wear. Safely holds a standard-size bottle of wine or similar sized oil and liquor bottles. This finely crafted sculpture makes a great gift for cowboys or any collector of western décor. 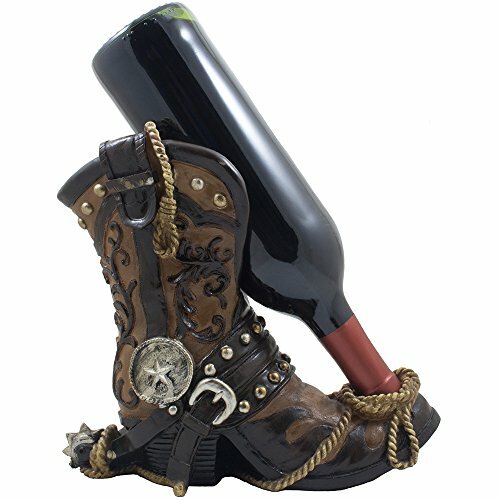 Add Country Western style to your bar or kitchen countertop with this fancy cowboy boot wine bottle holder. - See full description below. Dimensions: 10" x 4 3/4" x 9 1/8" high. Weight: 2.2 lbs. Individually hand-crafted from cold cast resin.